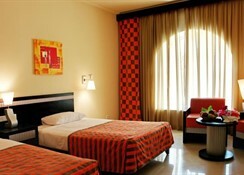 For business or pleasure, when in Hurghada book your stay at the comfortable Elysees Apartment Hotel. 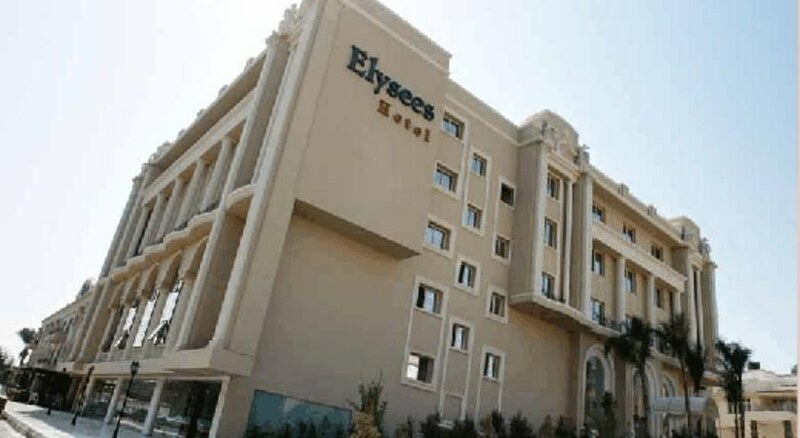 The Elysees Apartment Hotel features 178 air-conditioned guestrooms and apartments conveniently located in the heart of the lively city of Hurghada, near a natural bay with a pristine and white sandy beach. This is where the cool waters of the Red Sea and the warm Egyptian hospitality combine to create the memories of a lifetime. There are plenty of sightseeing trips to be booked with help from the friendly staff and the city centre is just a few minutes away with lots of shops, cafes, restaurants and attractions. 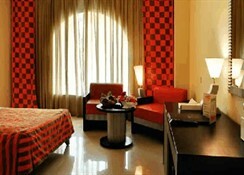 For an unforgettable holiday or business trip to Egypt, the All Inclusive Elysees Apartment Hotel is right on target! 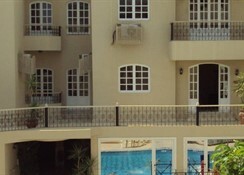 Hurghada Airport is 5 km from the Elysees Apartment Hotel. Local Tips: Book a trip on the sci-fi bubble contraption called the Aquascope at the nearby Hor Palace. You'll be submerged in a kind of semi-sub cabin with nine other people for about an hour and the show is natures best with Moray Eels, Lionfish and maybe even a shark or two. Please note: Rates and conditions are not valid for Saudi Arabia, Kuwait, Qatar, Bahrain, Oman, Iraq, U.A.E, Egypt, Lebanon, Jordan, Syria, Libya, Morocco, Tunisia and Algeria. The facilities at the Elysees Apartment Hotel offer everything you need for an outstanding holiday. Food, drink and entertainment: The Hollywood main dining room serves breakfast, lunch and dinner buffets. There is also the Lucky Dolphin English pub and a la carte restaurant, the Napoleon Coffee Shop, pool bar and beach bar. Sports, games and activities: Swimming pool, kids pool, kids clubs, entertainment theatre, health club and Spa, private beach, shopping arcade. Other activities include most water sports, deep sea fishing, beach volleyball, camel rides and more. Additional: 24-hour reception with free safe deposit boxes, bank, hotel clinic and doctor on call, shopping centre, shuttle bus to and from the airport in addition to sightseeing trips to down town (please check with reception for schedule), parking area, laundry, luggage storage, major credit cards accepted. The All-Inclusive program includes breakfast, lunch, tea and coffee break, and dinner. Beverages include soft drinks, hot drinks, and alcoholic drinks (local). Animation includes sport (Table Tennis, Darts, Water basket ball and Beach volley ball) and Entertainment and Kids Club. The Elysees Apartment Hotel features 130 luxurious rooms all with pool view, well furnished with twin beds, equipped with central air conditioning control, safe deposit box, Satellite T.V, direct dial phone line, private bathroom and hair dryer, 26 inch LCD T.V , and mini bar. Also offered are 48 apartments ( 22 apartments with one bedroom and 26 apartment with two bedrooms) from 75 to 100 square meters each apartment, with living area and fully equipped kitchen all with pool view, well furnished, Satellite T.V, direct dial phone line, private bathroom, and mini bar.